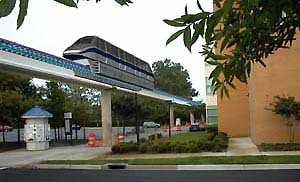 ODU made an agreement with American Maglev Technology Inc. to host a prototype maglev line across their campus. The line was scheduled to open in 2002, however ride quality and a shortage of funds have prevented success. The track is completely straight and is less than one mile long. Because of the short track length, 40 mph is expected the top speed for the 45-foot long vehicle (art rendering pictured above). The original project cost was $14 million.